As I am not the first to point out, Tomas Bannerhed’s The Ravens makes an interesting companion piece to Karl Ove Knausgaard’s Boyhood Island. Both novels are concerned with a young boy growing up in the Scandinavian countryside with an unpredictable father. In each the protagonists encounter the first stirrings of sexual attraction and the awkwardness of first relationships. 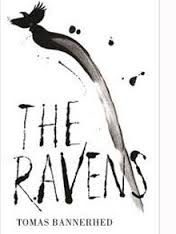 Bannerhed, however, takes a more lyrical approach – presumably freed from the constriction of reconstructing his own life – as can be seen from the novel’s title, the ravens representing the damaging thoughts that often crowd the father’s head and eventually lead to his hospitalisation. His fascination with the woodpecker perhaps suggests that he feels disconnected from his family, and the farm in particular – he talks about “the place you lot call home”. His father’s mantra is that there is too much to be done (“everything’s crowding in on me”), but Klas rarely offers to help. When his father, Agne, says, “You could come with me tomorrow morning and take a look…So you know how it’s done. The sowing.” we sense an old battle, one the father has already lost. Klas does not even fully understand his refusal (“something inside me resisted”), however his wariness of his father is evident from the beginning, as is the way his mother attempts to keep everything on an even keel, immediately diffusing potential flashpoints. Veronika picks up an egg from the nest and places it against her cheek: their discoveries in the darkness seem to be occurring within an inner landscape as well. All this time he feels threatened by the ravens “screeching from the moment I woke.” It becomes clear that the tension around him relates to previous experiences, and the approach of “the thing no-one was allowed to speak of” is inevitable. The Ravens did not make it onto the Independent Foreign Fiction Prize shortlist, but did make it onto our shadow shortlist – a decision uninfluenced by me as I had not finished reading it at the time, but one I now feel was fully justified. It’s a wonderful portrait not only of a young boy coming of age, but of a family dealing with the challenges of mental illness. It’s certainly very assured for a first novel, and suggests that this may not be Bannerhed’s last time on a prize list. This entry was posted on April 22, 2015 at 7:42 pm and is filed under Independent Foreign Fiction Prize 2015, Tomas Bannerhed. You can follow any responses to this entry through the RSS 2.0 feed. You can leave a response, or trackback from your own site. This is definitely a book that lingers in the imagination. I am so glad the shadow jury experience introduced me to it. I agree – this wasn’t a book I’d heard of but I’m very glad to have read it. I wrote the review a couple of weeks after finishing it and found I could immediately recall many memorable scenes. I like the idea of the different relationships in this novel: Klas’ connection with birds as a means of escape from the difficulties of his home life; his coming of age through the relationship with Veronika. Glad it made the shadow shortlist. That cover is very striking – simple but effective. Yes, I think the covers very effective. I was very pleased it made the shadow shortlist, particularly as I didn’t finish it in time to score it! I am having a terrible time with this! I’ve been reading it since the beginning of April and am not much past page 130. I’m not sure what the problem is, if I’m just burned out from 14 books in March or the annoyance of reading it on a glaring iPad screen (my only source). At any rate, I hope to finish it in this century as I know everyone on the jury loves it. I did leave this until near the end as it was the longest book, but once I started I found it very readable. I must admit that I find it difficult to read two or three books electronically in a row. Last year I read a few of the IFFP books on Kindle and I began to find that hard going. I found the solution to be reading a current best seller; the writing was so poor I came running back to The Ravens. It is hard reading for me, as my first husband suffered mental illness. But, it is a very moving and exquisitely written book. I’ll finish it today. While my vote had no part in earning its place on the Shadow Jury’s short list, having not read it in time for that, I am nonetheless not surprised it didn’t make the official short list. To me it was too drawn out, too long in description and too depressing in content. You wrote a beautiful review, so accurately portraying all the pieces, but somehow they did not sing for me when Bannerhed wrote them. It is easy to see how you might find this novel simply too depressing, especially given its length. At least you stuck it out to the end!